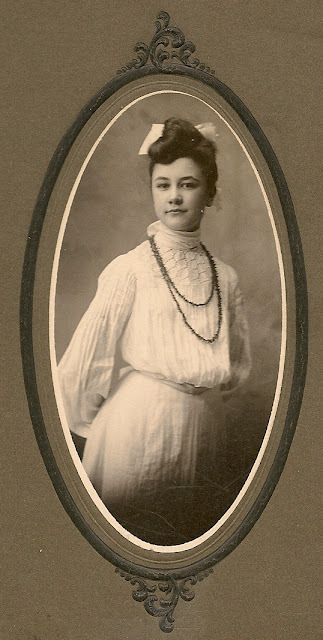 Today, I'm featuring a photo of my great-grandmother, Jessie Burrows. I just realized that I had completely forgotten to post a picture of the person with all the post cards. Jessie was born in 1887, the youngest of four children, to Charles and Erie Burrows. Her father was an early Police Chief of Wichita, Kansas. She attended Friends University and taught at Stella Friends Academy in Cherokee, Oklahoma, a frontier school. In 1909, she married my great-grandfather, Will Benton, a boy who lived down the street back in Wichita. They first moved to Florida and for a time ran a celery farm, but a transportation failure one year caused them to return to Kansas and then eventually make their way out to California. Eventually they settled in Laguna Beach, California, and ran a diner called Benton's Coffee Shop, down by the ocean. Jessie Benton was particularly known for her good pies. Jessie and Will raised five children together, but her life was cut short when she was killed by a drunk driver in 1960. Neat story but sad ending though. It's very cool that you have all those postcards and written words to help keep the memories alive. Wow, she looks great, very nice picture! This helps when reading the post cards. It's lovely to see the lady who received all those postcards. She was really pretty. What a beautiful lady! Nate, do you know if the restaurant building is still in Laguna Beach? What is it called now? I'd love to check it out since its about a 15 minute drive from my house. The shop was on the old boardwalk down at Main Beach. It's not there anymore, but if you ask the old timers, I'm sure they could tell you all about it. I'd give my kingdom just to experience a "caramel pecan roll" once more from Benton's Coffee shop in Laguna. That simple pleasure stop during childhood Laguna visits to Shaw's Cove and Crecent Bay beaches is forever etched in my mind.